In the city of Copenhagen even today, Nelson’s attack on the Danish fleet in 1801 and the ‘theft’ of the Danish navy in 1807 are often confused and even conflated into one. Many Danes today refer to Nelson as the ‘Stealer of the Danish Navy’ and wrongly label him with the guilt of the 1807 siege. British knowledge of the operations at Copenhagen is often also generally poor and patchy, with some knowledge of Nelson’s triumph, but often little else. This confusion needs correcting, but how has this come about? 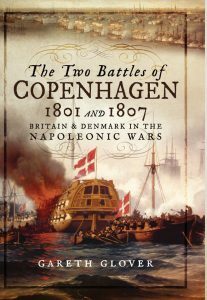 Over the years a few books have been published, describing Britain’s dealings with Denmark during the Napoleonic Wars, but they all concentrate specifically on only one or other of the two major operations carried out by British forces against Copenhagen during the period, as if they were completely unrelated incidents. This occurs for many varied reasons. Those who concentrate on the Battle of Copenhagen of 1801, the second and perhaps hardest won success of Admiral Horatio Nelson’s trilogy of stunning victories, rightly view it as a naval operation alone and consistently see later events as irrelevant to this episode, when Nelson was no more. Whereas, those who concentrate on the later Siege of Copenhagen in 1807, rarely give much more than a cursory glance at previous events. Again, personalities have a habit of obscuring the bigger picture, much of the writings on the siege concentrating on the first European success for Arthur Wellesley, the later Duke of Wellington, rather than the main events. It is as if the actions of 1801 bear little or no relevance on the largely land-based operations of the latter. Nothing however could be further from the truth. These single operation accounts fail to follow the connecting thread of relations between Britain and Denmark throughout the period or to adequately explore how the lessons of the one, influenced the latter. Nor indeed do they often consider what happened after these two momentous events, during the remaining eight years of war in Europe, including the consequent loss of Heligoland, the Danish West Indies and indeed the ultimate loss of Norway to their arch-enemy Sweden and state bankruptcy. There is much British guilt associated with both of the major events at Copenhagen, with many of those involved in the operations unclear on the legitimacy of British actions on either occasion, and clearly troubled by the legality of the orders they received from on high. The Danes had then and retain to this very day, a profound belief that the British acted illegally and immorally. These are indeed difficult waters to navigate. The Danes and the British have however, always shared a mutual respect for each other and both sides in these conflicts displayed not only a great deal of fortitude, gallantry and bravery, but also compassion and sympathy whilst ensuring that the operational objectives were attained, no matter how distasteful they were to the individuals involved. Perhaps the best illustration of this, was that the British public received news of these events with very much mixed emotions and it is certain that victory celebrations were particularly muted on these occasions. It highlights perhaps more than anything, that the British and the Danes recognise kindred spirits, both punching militarily way beyond their size, and this short period of conflict is anathema to both sides, an unfortunate episode, best forgotten. But to ignore it cannot be right, as sweeping past events under the carpet, rarely helps anyone. It is therefore high time that the fascinating story of Britain’s relationship with Denmark throughout the Napoleonic wars is dealt with in the whole, looking at both the naval and the land operations both in the Baltic and farther afield. This history of the Anglo-Danish war is the first to look at this conflict in the whole, but also to view each occurrence from the view point of both protagonists, to try to understand why it happened and why the British felt compelled to carry out the two attacks on Copenhagen. It is hoped that this history will help to heal a long-standing and deep open wound between what are ultimately two very similar peoples and to help both to understand the motivations of the other for the events of two hundred years ago.